With two bank holidays coming up, there will be a few changes to the usual delivery schedule. Orders placed by 12 noon on Friday 12 April, will be delivered on Wednesday 17 April. There will be no deliveries on Friday 19 April. The deadline to order a Piddle Patch for delivery on Wednesday 23 April has been moved forward to 12 noon on Wednesday 17 April. Deliveries and order deadlines will return to normal after this: – Orders placed by 12 noon on Monday will be delivered the following Friday. ✓ house-training dogs / teaching them to eliminate on grass only. ✓ dogs who urinate frequently throughout the day. ✓ dogs recovering from surgery or illness. ✓ dogs with reduced mobility. ✓ dogs living in an apartment without easy access to a grassy area. ✓ home-owners who want an alternative toilet to their lawn. ✓ dogs who refuse to eliminate during inclement weather. ✓ dogs who live on a boat and require an on-board litter. What days do you ship on? Our grass is harvested fresh for every order and delivered using a 24 hour courier service. To ensure the freshest possible product, we currently offer delivery on Wednesdays and Fridays. Orders placed by 12 noon on Fridays, will be delivered the following Wednesday. Orders placed by 12 noon on Mondays will be delivered on Fridays. If you have any questions or concerns about delivery dates, please contact us. You can remove the hassle of placing orders by setting up a Piddle Patch subscription for regular deliveries. Subscribe for ad-hoc, weekly or bi-weekly deliveries and relax in the knowledge that a fresh Piddle Patch will be delivered to you on a set date. Simply dispose of the old Piddle Patch – safe in the knowledge that it’s fully decomposable and environmentally friendly – and replace it with the new Piddle Patch. Where can Piddle Patch be shipped? Piddle Patch is currently available for shipping across mainland UK. Piddle Patch is committed to producing the best possible product for your dog, your home and the environment. Our mission is to provide a solution that dogs and their owners love, while reducing the amount of non-decomposable waste being sent to landfills and minimising the carbon impact of dogs and their owners. When disposed of correctly, Piddle Patch is a zero-waste product! Our grass is grown in the UK using LEAF – Linking Environment and Farming principles – for sustainable agriculture. We divert textiles from landfill and re-purpose them as a base from which our grass grows. Not only does this give our grass a thick, healthy root structure from which it can live and grow while not planted in the ground, but it helps to reduce waste and lower the carbon impact these materials would otherwise have if they were sent to landfill. We carefully select all of the components to ensure they are either biodegradable or recyclable. Piddle Patch grass can be placed into the garden waste collection, where it will be composted into nutrient rich soil. The box, paper packing tape and paper materials can be recycled. The plastic courier wallet is oxo-biodegradable. The liner in the box is bio-compostable and certified to the European compostabilty standard EN-13432. Piddle Patch is delivered to your door via our preferred courier, Parcelforce, which commits to comply with all current and future environmental legislation and to minimise pollution and any adverse environmental impacts their work causes. What size is Piddle Patch? Our first Piddle Patch is 62 (L) x 48 (W) x 5 (D) cm. Can my rabbit or guinea pig use Piddle Patch? Piddle Patch grass is grown without harmful chemicals and is safe if ingested by small animals or babies. However, it has not been grown with the intention of being animal feed. The roots are grown in recycled textiles which should not be eaten. If you choose to give your animal Piddle Patch to nibble on, you do so at your own risk. Supervision is recommended. Can I compost used Piddle Patches? Used Piddle Patches can safely be composted and used as a soil additive for lawn care and flower beds. It should not be used on crops being grown for human consumption. How do I know when I'll receive my order? You will receive an email from us ahead of each shipment which will confirm the date your parcel is scheduled for delivery. This notification will also provide a tracking number that you can use to track your delivery. Yes, of course! You can either login to our portal to pause your subscription yourself, or send an email and let us know how long you would like for your subscription to be paused. How will my Piddle Patch be delivered? Piddle Patch is shipped twice a week and delivered on Wednesdays and Fridays. The order deadline is Monday at noon for deliveries the following Friday. The order deadline is Friday at noon for deliveries the following Wednesday. Within 1 business day of the order deadline, you will be sent an update to your order confirming the delivery of your Piddle Patch and your Parcelforce tracking number. You can track your shipment from the night before delivery (Tuesday or Thursday) on www.parcelforce.com/track-trace by inputting your shipment number. I need to arrange a redelivery. What should I do? If you need to change the details of your delivery before your Piddle Patch has been shipped the day before your delivery is due, then please email me on rebecca AT piddlepatch.com and let me know the details of your request. I will do my best to accomodate the change. If you need to make a change to your delivery or arrange a redelivery after the item has been shipped, then please contact your local Parcelforce Depot to make suitable arrangements. Use the Parcelforce Depot Finder and enter in the postcode you used for your (original) delivery address in order to identify the relevant depot. You will then be shown a telephone number and the hours of operation for this depot. Where is my Piddle Patch? We send out a shipment notice once your order has been processed which contains a Parcelforce tracking number. You can use this tracking number on Parcelforce’s Track and Trace service to find out more information about your delivery. If you have any questions about your delivery once your Piddle Patch has been shipped (the day before delivery is expected), then please contact your local depot directly. Your local depot can be found using the Parcelforce Depot Finder and inputting the postcode used for your delivery. What is Piddle Patch made from? Piddle Patch is made from fresh grass! Our grass is grown in recycled textiles instead of soil to prolong the life of the grass and to prevent your dog from tracking messy paw prints through the house. How long will Piddle Patch last? Most dog’s get an average of two weeks use from a Piddle Patch before they require a replacement. A number of factors play into the lifespan of your Piddle Patch, including frequency of use and whether you provide any care for your Piddle Patch. How do I prolong the life of my Piddle Patch? Placing your dog’s Piddle Patch in an area with natural light, and lightly misting it with water on occasion can help to prolong the life of your Piddle Patch. We recommend you water your Piddle Patch using a water bottle with a misting function, as watering your grass directly may overwhelm the root system and cause flooding. Some dogs do not like the feel of longer grass, in which case you would want to trim your Piddle Patch or replace it when the grass becomes too long. How do I clean Piddle Patch? Piddle Patch is a low-maintenance litter solution. Urine is drained naturally from the surface, however solid waste must be disposed of. We recommend removing the waste using toilet paper and flushing it down the toilet. While caring for your Piddle Patch may extend it’s lifespan, there is no requirement to do so and Piddle Patch will last between 1-2 weeks before a replacement is required. When you are ready to dispose of your Piddle Patch, simply remove the entire product and place it into the garden waste collection (where applicable). What are the environmental benefits to using Piddle Patch instead of puppy pads? 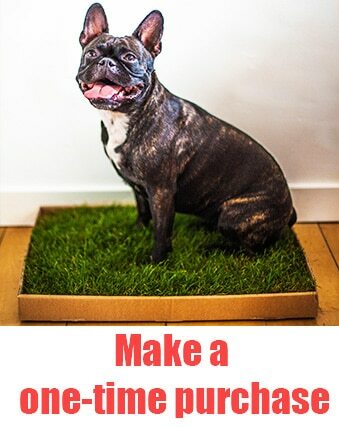 Dogs love fresh grass and many know instinctively what to do with a Piddle Patch! As a natural product Piddle Patch is good for your dog and good for the environment. Piddle Patch is 100% biodegradable and it’s packaging is biodegradable/recyclable. If disposed of into the garden waste collection, Piddle Patch can be safely transformed into compost or converted into energy via anaerobic digestion! 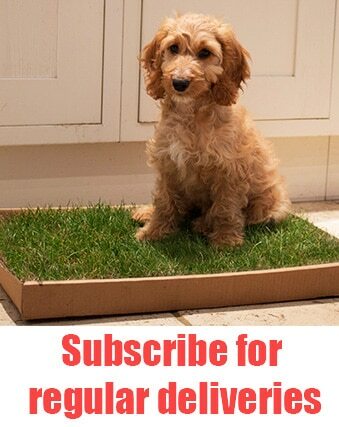 In contrast, dog training pads are non recyclable materials which take up to 500 years to decompose in landfill. That mean’s it could be possible for your children’s children children (up to 23 more times) to one day find your dog’s training pad and uncover their waste still preserved inside. Gross! Where is Piddle Patch grown? We grow our grass right here in the UK! By purchasing a Piddle Patch, you’re helping to support British agriculture. Why is real grass better than artificial turf? While artificial grass may seem like a fuss-free solution, it can come with a lot of challenges. First, many dogs simply don’t like it and refuse to use it. But beyond that, artificial grass requires a lot of maintenance and regular cleaning using harsh chemicals to ensure it’s kept in a hygienic condition. While urine may drain through the grass into a tray beneath it, you’ll need to drain and clean the tray and grass frequently to prevent odours from building up. Furthermore, as dog waste is highly toxic, you’ll need to ensure that the bacteria is treated using disinfecting chemicals. If not carefully treated and rinsed, these chemicals can pose a health risk to your dog, who will walk on the grass and may accidentally ingest them while grooming. Why shouldn't I just use grass from the local garden centre? Piddle Patch grass offers a number of benefits over the grass you’ll find at your local garden centre. The grass at garden centres will wilt and die within 48 hours if it’s not planted into the ground. By growing our grass in recycled textiles, we prolong the grass’ natural life and ensure a strong, healthy product. The grass at garden centres is grown in dirt which easily falls from the roots of the plant. It won’t take long for you to find dirt and mud throughout your home. We accept Visa, MasterCard, American Express, Maestro and Paypal. If you choose to pay via Paypal, you will be directed to the PayPal site to ‘Log In’, or make payment as a guest, and review the amount shown before clicking ‘Pay Now’. Subscribe & Take A Task Off Your To-Do List! All products include free UK mainland delivery. Your dog deserves a natural solution.